Your only carry and birth this baby once. You’ll never get this time again. So give yourself and your baby this opportunity now. – Kate, Matt, Lily and baby Maisie. For Lincolnshire we are in Lincoln in easy reach of Market Rasen Grimsby, Cleethorpes, Louth, Woodall Spa, Horncastle, Seaford, Grantaham, Newark, Nottingham, Southhal, Gainsborough, Brigg, Scunthorpe, Doncaster. Now it really doesn’t matter why you’re here but I’m guessing you’ve either birthed before and don’t want to repeat the experience. Or you’re a first time mum and you’ve heard a few ‘stories’ about leaving your dignity at the door and you’d prefer to avoid a situation like that if at all possible. Even if this is your second or more baby it still feels like you don’t know ‘how to do it’ because the whole birthing process felt like it was taken out of your hands the first time round. Really, you just want to know if there’s anything you can do to help birth your beautiful baby in an easier, calmer way. After all, you know in your heart there has to be a better way to birth (we would have died out as a human race along time ago if it was always going to be that bad, right?) than the horror stories that appear to be on offer from the media, well meaning friends and family but you just don’t know what that is yet? So what if I told you now not to give those birth stories the time of day. That your baby’s birth story is yet to be written. That you have the personal recourses to cope with any given birthing situation. That you could influence your baby’s birth experience and make it a calmer, more positive, more relaxed experience? So what if I told you now that you that you hold the power to positive birth experience. You have the power to birth your baby calmly, confidently and in full control no matter what turn your baby’s birth takes. I don’t own a crystal ball or a time machine so I can’t guarantee you any specific outcome. There are so many variables in birth that no birth preparation course ever can offer you that. BUT with the right information you can gather up your personal recourses, learn to listen to your body, recognize what you and your baby need. To learn how to use your mind you help yourself, to work for you opposed to against you (you know that voice in your head that says Oh No! You cant possible do that, well YES actually you can!) allowing you to birth your baby the best way you can. The Tools for Birth - Hypnobirthing Home Study Course is packed full of simple, easy to get to grips with hypnobirthing tools and techniques that will help you move through your labour calmly, confidently and in full control of your thoughts and emotions. You can either work together as a dream team with your birth partner or go solo and learn those skills yourself (I have to say I went solo even though my husband was very much around I felt I needed to know I could do it by myself). Positively Blooming Tools for Birth - Hypnobirthing Home Study Course is 'A Complete Guide to Hypnobirthing' for you if you want a no nonsense guide to birth and the use of applied psychology and hypnotherapy for childbirth. Positively Blooming Tools for Birth - Hypnobirthing Home Study Course is packed full of simple, easy to follow information and proven tools and techniques. 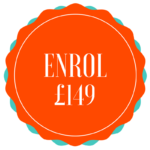 The Home Study Hypnobirthing Course will suit you if you are planning to birth in hospital, just like I did or at home like many of my previous first time mums have (take a peek at their birth stories here). 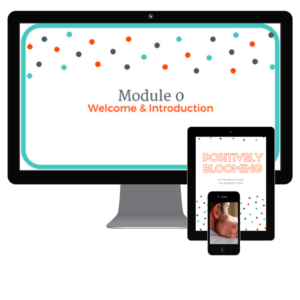 The Positively Blooming Home Study Hypnobirthing Course is packed full of activities, audios, transcripts and the odd video to help you gain a fresh perspective on birth. 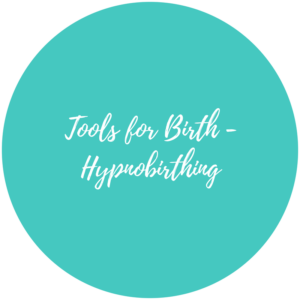 Helping you to understand the ‘how’ and ‘why’ of how hypnobirthing works and in easy bite sized pieces allowing you to fit it all into your lifestyle with ease. Positively Blooming Home Study Hypnobirthing Course is for you if you are willing to put in 100% effort, this course will require effort on your part and you will get out of it exactly what you put in but I know you’re wiling to do that, that’s why you’re still reading this. And just for good measure after you’ve completed the course and you have a wobble, I will catch up with you or over Skype. Your Positively Blooming home study hypnobirthing course is waiting for you as soon as you enrol. How to get the best out of this course, you want that and I want that for you too, so don't skip this bit! Getting stuck in and making your commitment to yourself and your baby with your thinking girls guide to birth Introduction Handbook. Get a taste for relaxation and start preparing for your baby birth immediately with your Hypnosis for Pregnancy MP3. As the good witch said to Dorothy in the Wizard of Oz, "you had the power all the time my dear", now you just have to find out how to use it. It's your mind, you own it and you get to choose how you use it. Don't take my word for it - lets prove it with the ultimate mind blowing experiment, your big kids (if you have them) & birth partners (okay so same thing there) will love this and entertain their mates for hours with it! This is the foundation stone of the course. Let's demystify hypnosis, after all its normal, its natural and your are already a master of it - yes really! Gather your personal resources & refine those in-built skills of yours with easy to follow Guided Self Hypnosis MP3's & Scripts in preparation for your baby birth day. Your pregnancy, your body, your baby's birth, its not one size fits all, find out what type of birth will works best for you given your circumstances. A rule of thumb to guide you from those early twinges to the final moments in labour. Find out exactly what you can control and accept what you can't during the birth process. And baby came too! How does your baby manage during birth. Bonding time during pregnancy, probably the best bit! Breathing, breathing and more breathing for pregnancy and birth preparation. Tips for bringing on labour, tips for when labour stops or slows, tips to easily calm & relax yourself regardless of where you are and what's going on around you. Feeling confident, calm, in control and ready to go, preparing for a perfectly positive birth. Your environment, your birth bag, your check list for a Positively Blooming birth. Another job on the list, your support and practice in the run up to your baby birth. Your questions answered, how to and when to step in and help your partner in labour. Being an advocate for your partner & understanding the hunter and gatherer in you. Oi! Mind your language, some words and phases that help in labour and the ones to avoid because they may hinder. 6: New Mummy Bonus. You'll receive this once your baby has arrived. Make sure you let us know when you're holding your baby in your arms so we can forward it on to you. Your New Mummy Bonus will contain lots of hints, tips and tricks from many established postnatal specialist and of course a bit of 'hypno' from me because thats the one of things my clients say they miss most after their baby is born. I offer a 7 day money back guarantee, so if you decide the Home Study Hypnobirthing Course isn't for you, let me know within 7 days and I will offer you a full refund no questions asked and no hard feeling. Although I sincerely hope you stick with the course and reap the benefits of hypnobirthing just like the 100's of clients that have gone before you. .